A rendering at dusk of the proposed Riverline development at Harrison and Wells streets. DOWNTOWN — Three of Chicago's most ambitious developments proposed since the recession are one step closer to reality. The Chicago Plan Commission on Thursday signed off on the supertall Wanda Vista Tower on Wacker Drive, a pair of of high-rises that would bookend the southern tip of Grant Park, and a group of eight buildings including more than 3,600 new homes on a riverfront field blocks from Willis Tower that's sat vacant for decades. 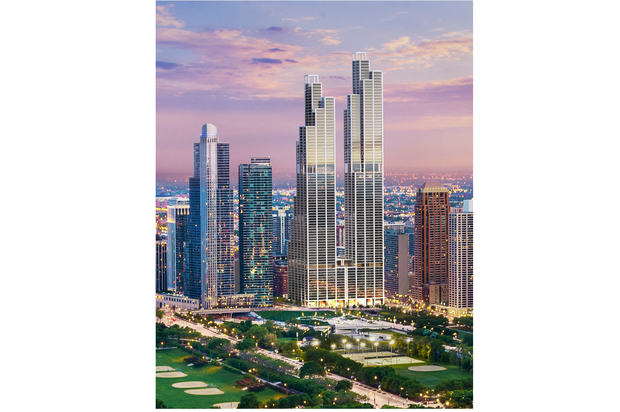 • Wanda Vista, a 93-story, $1-billion skyscraper designed by star Chicago architect Jeanne Gang, would be the third-tallest in the city. • The South Loop skyscrapers, the shorter one rising 76 stories, would be the second-tallest south of Willis Tower, assuming a proposed 86-story tower designed by Helmut Jahn at 1000 S. Michigan Ave. is eventually built. • And the third project, called Riverline, would add thousands of people to a 6.5-acre site off South Wells Street that's been a de facto park since Grand Central Station was demolished in 1971. "It's been a lot of small potatoes lately and I'm really happy to see that we're thinking big again," Shawn Ursini, a Chicagoan who spoke at Thursday's meeting, said. First unveiled in April, Wanda Vista would rise 1,200 feet high and include 410 luxury condominiums and 210 hotel rooms. Gang, the architect, said her design stacks "frustums" — or truncated pyramids — to enhance light and cast less shade on passersby below. 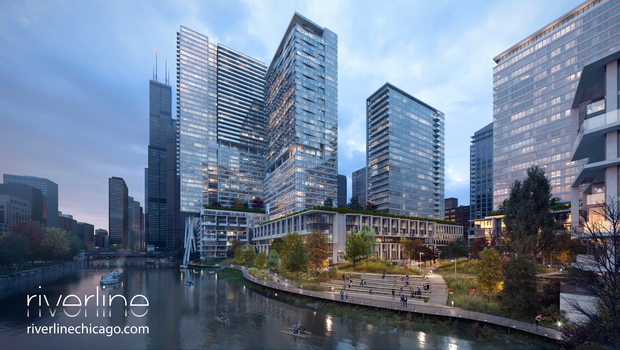 The project also calls for a Wacker Drive extension underneath the tower connecting to the rest of its Lakeshore East neighborhood, and a new "pocket park" replacing the concrete motorist turnaround at the eastern end of Upper Wacker Drive. The 1.6-million-square-foot development is a joint venture between Chinese conglomerate Wanda Group and Chicago-based Magellan Development, the latter of which controls the Lakeshore East neighborhood near the southeast junction of Lake Michigan and the Chicago River. The project heads next to a city council committee, which will vote on whether to forward the proposal to the full council for final approval. Designed by New York architect Rafael Viñoly, the twin towers Miami-based Crescent Heights wants to build at Roosevelt Road and Indiana Avenue would be built in phases and eventually contain 1,440 units. The first, smaller tower would include 792 apartments, and the second, slightly taller one is slated for condos. A public park and 100 town homes off Indiana are also part of the plan. Unlike Wanda Vista, the Crescent Heights proposal was simply an amendment to the city's "master plan" for the area and does not require further city approval. Jason Buchberg, a Chicago-based Crescent Heights executive, said financing is "in process" for the $300-million project. The developer also agreed to donate $100,000 each to Armstrong, Chicago Women's, and Webster parks as part of its agreement with the city, Ald. Pat Dowell (3rd) said Thursday. Riverline, a joint venture between Chicago-based CMK Cos. and Sydney-based construction titan Lendlease, is composed of eight buildings containing more than 3,600 homes. The mega project at the southwest corner of Harrison and Wells streets would circle a three-acre park and also include a public riverwalk, water taxi stop and some retail. The eight-to-10 year project would also be built in phases, and contribute $8.7 million to the city's affordable housing fund in lieu of including affordable housing units. 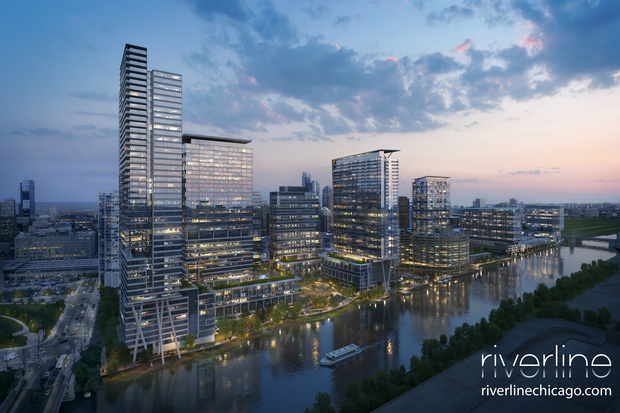 Like Wanda Vista, Riverline also requires final city council approval. CMK recently acquired the site, which has long enticed but also stymied several developers who attempted and failed to build on the land. 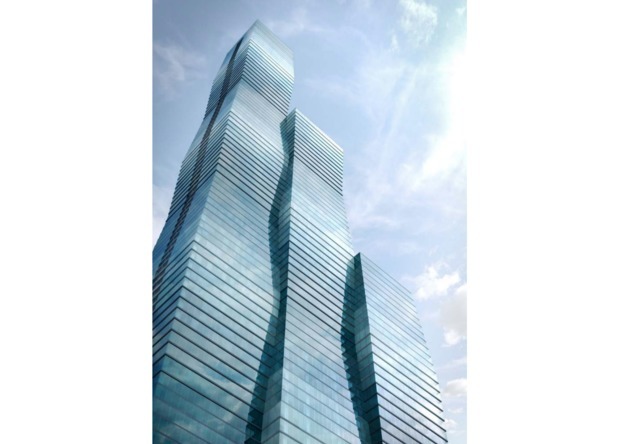 The tallest of CMK's proposed Riverline towers is 47 stories, a scale some observers Thursday thought doesn't match the promise of the Downtown site. But, the plan commission apparently agreed with the sentiment that it's better than what's there now: nothing. "This is certainly going to be a great transformation for an area that hasn't really seen anything since the train station was torn down," Butler Adams, a Chicagoan who spoke at the meeting, said. • A 22-story apartment-and-office project at Hubbard and Wells streets in River North. • A five-story apartment building near the Western Brown Line station in Lincoln Square. • A redevelopment of Pensacola Place in Uptown.